This post may contain affiliate text and photo links. If you purchase something through the link we may receive a small commission at no extra charge to you. 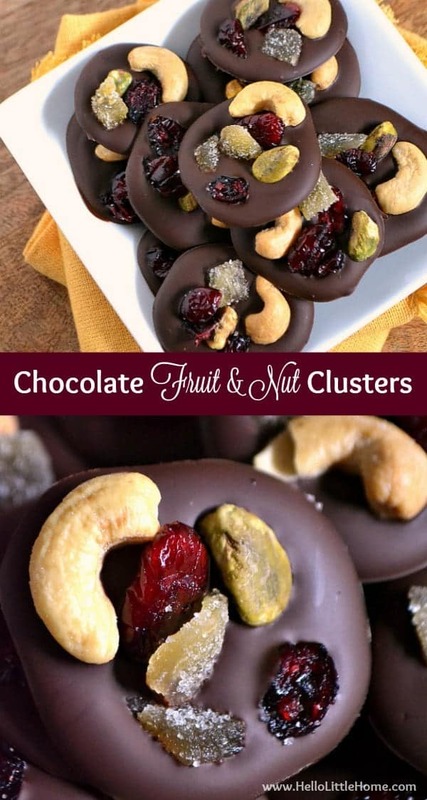 Treat your friends and family to these Chocolate Fruit and Nut Clusters! Hi, it’s Ginnie from Hello Little Home! 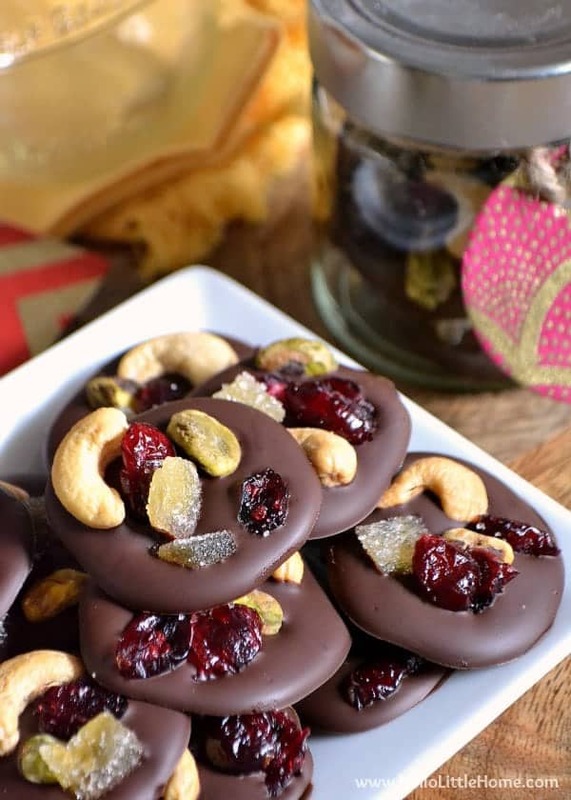 I’m excited to be back and sharing a yummy holiday recipe, Chocolate Fruit and Nut Clusters. My mom always bought big blocks of chocolate every holiday season. Then we’d spend our free time making all sorts of chocolate treats. It was fun and delicious! This year, I decided to follow her lead. 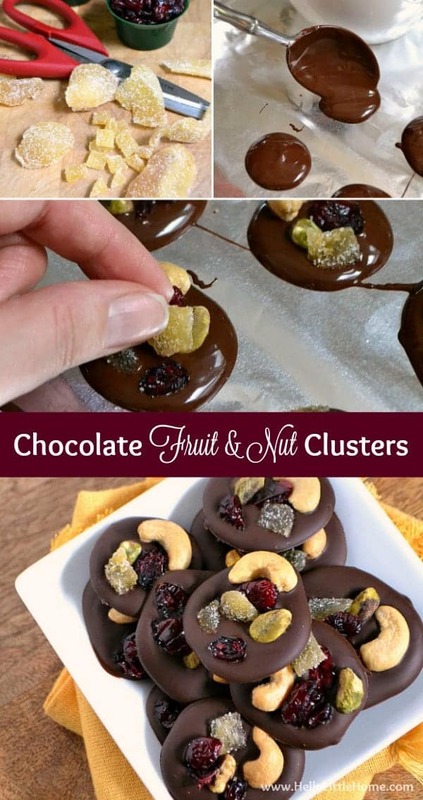 I picked up some dark chocolate and made these Chocolate Fruit and Nut Clusters. These chocolates are beautiful and taste even better than they look. Plus, they couldn’t be easier to make. My favorite part about these chocolates may just be how customizable they are. 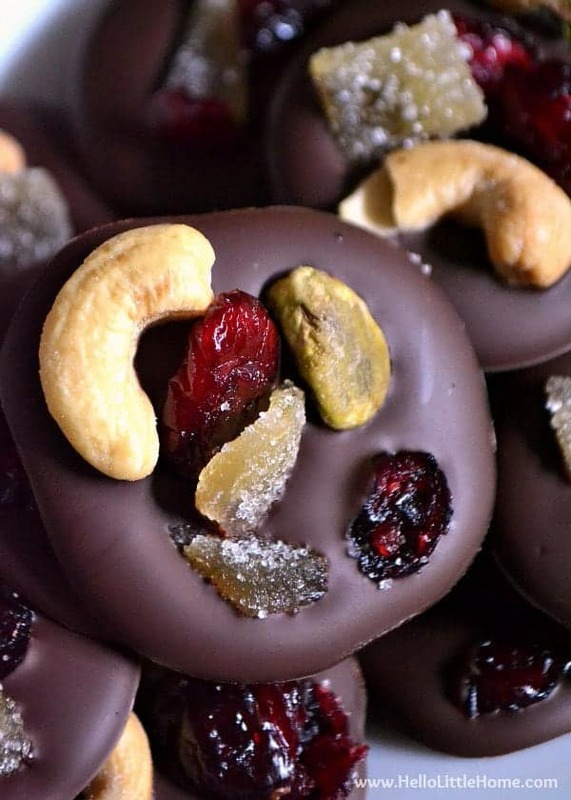 I used a mixture of cashews, pistachios, dried cranberries, and candied ginger. Any combination of dried fruits and nuts would work though, so pick your favorites. Choose your favorite kind of chocolate, too. Everything from sweet milk chocolate to rich dark chocolate will work. I didn’t want my clusters to be too sweet, so I used bittersweet chocolate. No matter what fruits, nuts, and chocolate you use, these Chocolate Fruit and Nut Clusters are sure to be delicious. Make a batch to give and one to keep! Line a couple baking sheets with tin foil. Set aside. 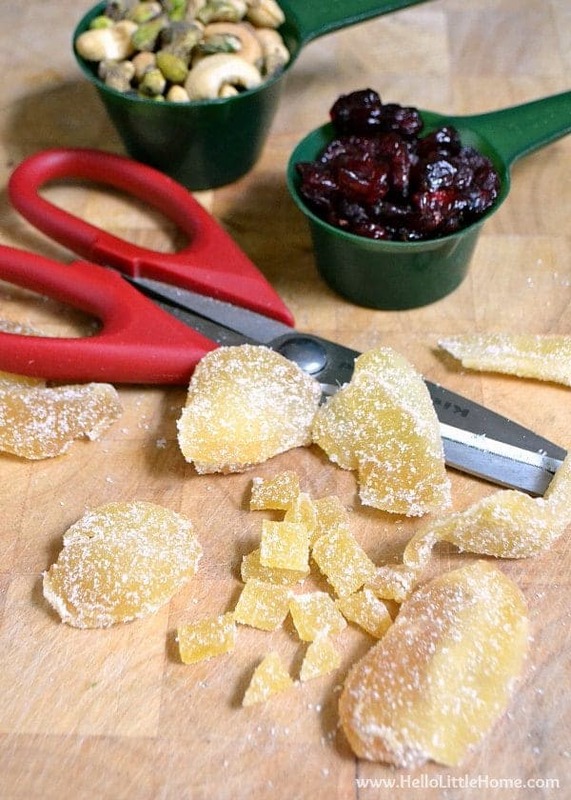 Cut ginger into bite sized pieces with a pair of kitchen shears. Set aside. Chop the chocolate into small pieces and place in a medium bowl. Heat chocolate in the microwave for 25 seconds, mix very well, then microwave for another 25 seconds. Repeat this process until chocolate is melted. Do not overheat. 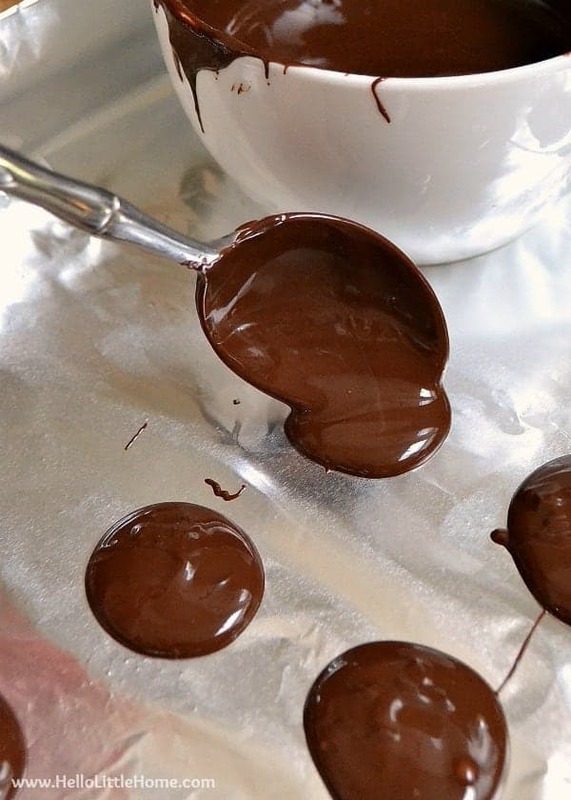 Drop a teaspoon of melted chocolate onto the lined baking sheet. Repeat with remaining chocolate. 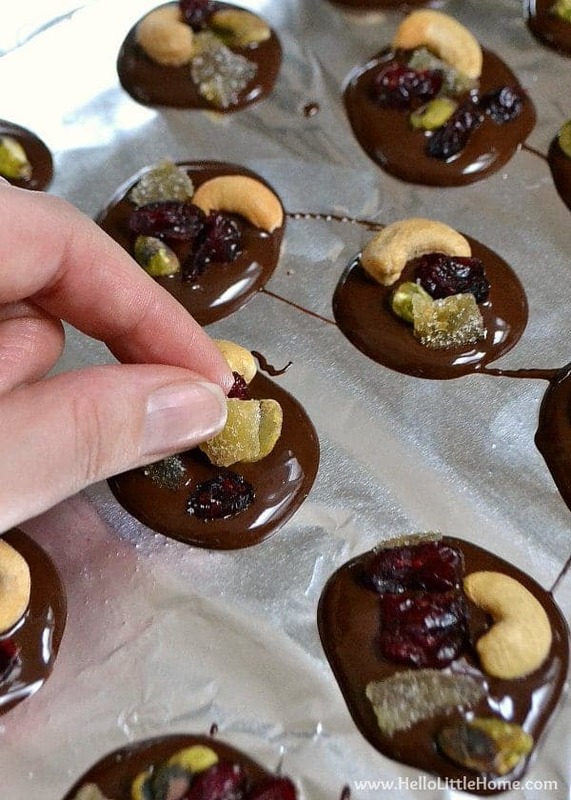 Cover chocolate with fruit and nuts. Place tray in freezer for about 5 minutes or until chocolate is set. Remove tray from freezer, then separate chocolates from tin foil. Store in an airtight container and refrigerate until ready to serve. Tag @easyfamilyrecipes on Instagram and hashtag it #easyfamilyrecipes. 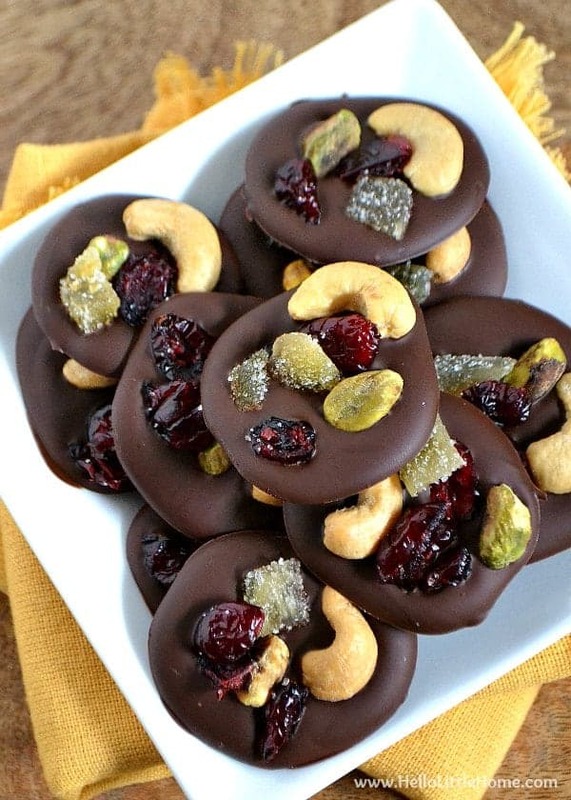 If you like this Chocolate Fruit and Nut Clusters recipe, you’ll love these posts, too! Hi, I’m Ginnie, and I blog over at Hello Little Home! I’m a married New Yorker with a creative streak, and I love to write about some of my favorite things: food, DIY, fashion, interior design, travel, and more. Get new family friendly recipes and kitchen tips straight to your inbox! Yum! Dark chocolate would be wonderful, too!